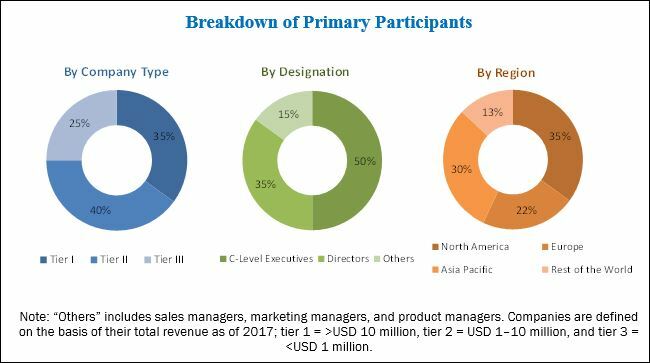 [93 Pages Report] The laser cleaning market was valued at USD 551.1 Million in 2017 and is expected to reach USD 723.9 Million by 2023, at a CAGR of 4.22% during the forecast period. The base year considered for the study is 2017 and the forecast period is between 2018 and 2023. This report provides valuable insights into the ecosystem of the laser cleaning market. Major players profiled in this report are Coherent, Inc. (Coherent) (US), Trumpf Group (Trumpf) (Germany), IPG Photonics Corporation (IPG Photonics) (US), Adapt Laser Systems LLC (Adapt Laser) (US), and Clean Lasersysteme GmbH (Clean Lasersysteme) (Germany). The overall laser cleaning market is projected to exhibit lucrative growth potential during the forecast period. The market growth is propelled by the preference toward laser cleaning over traditional approach and the increasing demand for laser cleaning in various applications. 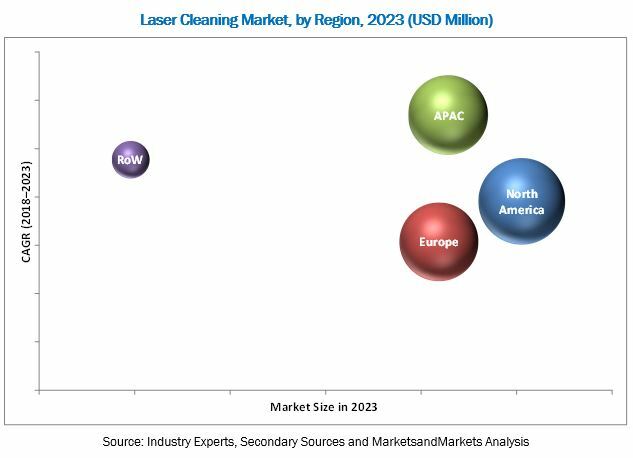 The laser cleaning market was valued at USD 588.8 Million in 2018 and is expected to reach USD 723.9 Million by 2023, at a CAGR of 4.22% during the forecast period. The report covers the laser cleaning market on the basis of laser type, applications, and geography. Among applications, cleaning process accounted for the largest market in 2017. In the automotive industry, laser is used in tire mold cleaning and brake line decoating systems. The growth of laser cleaning systems can be attributed to factors such as increasing use of high-energy pulsed 49 lasers for the ablation of organic materials and surface activation tasks. The laser cleaning market by cleaning process for aerospace and aircraft is expected to grow at a higher CAGR during the forecast period. The growth is because of the global commercial aerospace subsector, which is likely to experience strong revenue and operating earnings growth in the near future. This will be a result of continued record production levels driven by strong demand for next-generation aircraft and growing passenger traffic. The growth is expected to mainly impact Asia Pacific and the Middle East. On the other hand, the commercial passenger and cargo aircraft and the annual number of passengers are expected to witness an expedited growth during the forecast period, which will be further responsible for the increased use of laser for cleaning due to growing air traffic. Among laser type, solid lasers are expected to lead the overall laser cleaning market because of the higher CAGR during the forecast period. The solid laser segment includes YAG and fiber lasers. The market is dominated by the YAG laser segment as YAG lasers (Nd:YAG, flash-pumped Q-switched Nd:YAG, arc-lamp pumped Q-switched Nd: YAG, and diode-pumped Q-switched Nd:YAG) are extensively used for cleaning and for other material processing applications. In the precision mechanical industry, YAG lasers play a crucial role to clean parts that have grease and mineral oils applied as lubricants or as anti-corrosives. The laser cleaning method reduces the residual contamination to practically zero level. North America is accounted for the largest share of the laser cleaning market in 2018, followed by Europe and Asia Pacific (APAC). There is an increase in the demand for gas lasers in North America owing to the establishment of the manufacturing sector in the region. Laser cleaning systems are mainly used for the conservation and restoration of antique items and in automotive and aerospace industries and power plants. The growth of this market in Asia Pacific can be attributed to the increased use of laser cleaning in automotive parts and aerospace maintenance sector. The growth of the laser cleaning market in APAC is also driven by the rising infrastructure market in the region. The high cost and lack of technical expertise are restraining the growth of the laser cleaning market. In 2016, Key players such as Coherent, Inc. (Coherent) (US), Trumpf Group (Trumpf) (Germany), IPG Photonics Corporation (IPG Photonics) (US), Adapt Laser Systems LLC (Adapt Laser) (US), and Clean Lasersysteme GmbH (Clean Lasersysteme) (Germany) led the laser cleaning market.